BUFFALO, NY.- The Albright-Knox Art Gallery has acquired 71 artworks by 15 artists, all from the collection of Count Giuseppe Panza di Biumo, through the generosity of the Panza Family and with funds from the Gallerys special endowment for art acquisitions. The works were included in the recent exhibition The Panza Collection: An Experience of Color and Light, which was on view at the Albright-Knox from November 16, 2007 to February 24, 2008. Designed and installed by Dr. Panza in collaboration with Albright-Knox Director Louis Grachos and Chief Curator Douglas Dreishpoon, the Color and Light exhibition spans a forty-year period from the mid-1960s to the present. The acquisition includes important Light and Space works by Dan Flavin, Joseph Kosuth, and Robert Irwin; paintings by Anne Appleby, Max Cole, Alfonso Fratteggiani Bianchi, Ruth Ann Fredenthal, Timothy Litzmann, David Simpson, Phil Sims, and Winston Roeth; an early wall drawing by Sol LeWitt; and sculptures by Stuart Arends, Robert Therrien, and Anne Truitt. 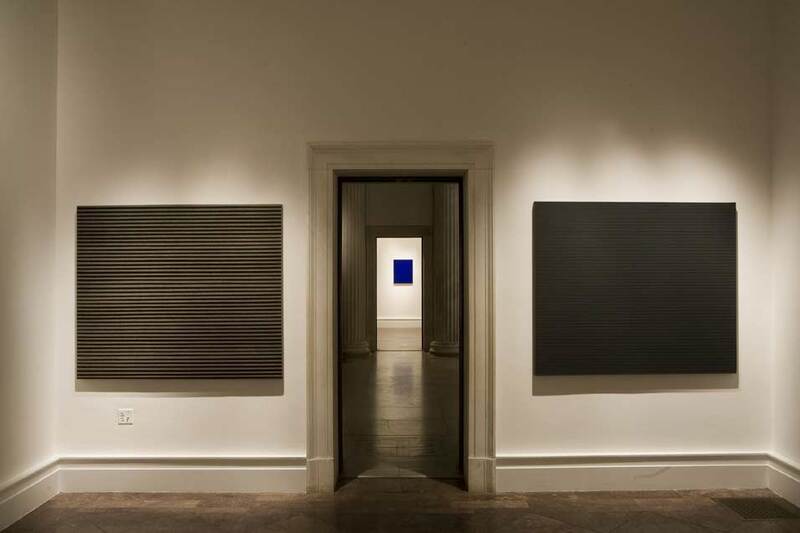 The acquisition significantly enhances the Gallerys holdings of Dan Flavin, Robert Irwin, Sol LeWitt, Anne Truitt, and Robert Therrien. LeWitts Wall Drawing #17 from the Panza Collection complements the Gallerys work by that artist, 3-B Half-Off Piece from 1971, as well as an earlier painted wood sculpture, Wall Structure: Five Modules with One Cube, from 1965. Six sculptures from the Panza Collection by Ann Truitt now join her work, Sentinel, 1978, which was gifted to the Gallery in 1980 by Seymour H. Knox Jr. An untitled painting by Robert Irwin from 1962-63, given to the Gallery by Seymour H. Knox, Jr. shortly after its completion, is complemented by the early Light and Space work, Plastic Disc, 1968-69, from the Panza Collection. Dan Flavin is another Light and Space artist whose Untitled (to Donna), 6, from 1971, is amplified by the Panza Collections series of four works, untitled (to the citizens of the Swiss cantons) 1-4 from 1987. And finally, with the Panza acquisition, the Albright-Knox now owns a significant representation of Robert Therriens sculpture: iconic works from the 1980s, in addition to a monumental folding table and chairs from 2006, acquired last year. Since the early 1980s, Dr. Panza has sold or donated portions of his collection to designated American museums, including the Museum of Contemporary Art in Los Angeles, the Solomon R. Guggenheim Museum in New York, and the Hirshhorn Museum and Sculpture Garden in Washington, D.C. In Europe, the Cantonal Museum in Lugano, Switzerland, the Palazzo Ducale in Sassuolo, Italy, and the Villa Panza in Varese, Italy, are beneficiaries of his largesse.